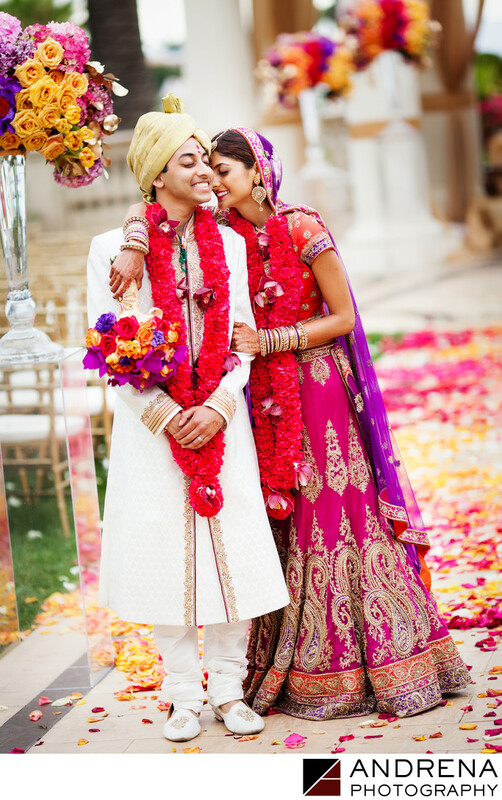 This beautiful Indian wedding took place at the stunning St. Regis in Monarch Beach, California. This wedding was especially lovely to me, as I also shot this bride's sister's wedding a few years prior. Fayaz at Bloom Box Designs provided the beautiful decor for the ceremony, which took place on the St. Regis Grand Lawn. The floral color scheme of oranges, fuchsias, purples and reds gave the foggy wedding day a bright pop of energy, and provided a gorgeous backdrop to the bridal couple's wedding outfits. The couple chose a color scheme of blue and white for their reception, which provided a fun contrast to the bright colors of the ceremony. Coordination was provided by Nutan Shah and Seema Shah at Elegant Events, who ensured that everything moved along without a hitch throughout the day. I love this sweet moment where the bride and groom shared a giggle. Indian wedding photographed at the St. Regis in Monarch Beach, California.